SMS gateways of SMS service providers and wireless carriers very often support one or more of the following protocols / interfaces: HTTP, HTTPS (HTTP + SSL encryption), XML over HTTP / HTTPS, SMTP (email to SMS), FTP. Some also support the SMPP protocol, which is usually used by advanced users. SMSC protocols other than SMPP are not commonly supported. "smsgateway.company123.com" is the host name of the SMS gateway that the SMS text message should be sent to. "sendsms" is the file name of the CGI program that will be executed on the SMS gateway. "account=account123" is used to assign the value account123 to the account parameter. The account parameter specifies which account that the cost of the SMS text message should be deducted from. "password=password123" is used to assign the value password123 to the password parameter. The password parameter specifies the password of the account. "destination=61234567" is used to assign the value 61234567 to the destination parameter. The destination parameter specifies the recipient's mobile phone number. "textmessage=It+is+easy+to+send+text+messages" is used to assign the value It is easy to send text messages to the textmessage parameter. 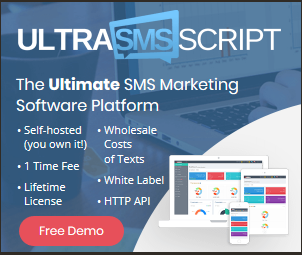 The textmessage parameter specifies the SMS text message to be sent. There exists some "+" characters because the space character is a special character and it should be escaped if it appears in an URL. The escaped character of the space character is the "+" character. After receiving your HTTP request, the SMS gateway will forward your SMS text message towards the recipient. The SMS gateway will then send back an HTTP response that contains a return value. The return value indicates whether there are any errors. For example, a certain SMS gateway may use the return value 0 to indicate that there is no error, the return value 1 to indicate the error "The account does not have enough credits", the return value 2 to indicate the error "The SMS message is too long", etc.